“Spain is different”. Rentals are a good example: Everything is negotiable or nearly, depending on the market. In a rental, all the conditions depend on the agreement you reach with the landlord. When you negotiate these conditions, it is essential you have in mind the law and the norm: yes, in Spain they are often different. In this post, I will sum up the security deposit and other conditions you can expect so you can get the best deal and negotiate with landlords effectively. The legal amount for a security deposit is 1 month’s rent, 2 month’s rent if furnished. The tenant can leave at any time after the 1st year, whereas the law only indicates at every yearly renewal. For flats, on average, 2-3 months in total, but many landlords ask for up to 8 months.To be negotiated. Many landlords now ask for “bank guarantees” or “aval bancario”. This means that you have to put the amount of the additional guarantee in a specific bank account, on which you will have to pay 4% risk commission a year. The landlord will have rights to access to this account if anything was to happen. My opinion is that 2 months in total is reasonable and fair, especially for a furnished flat. 3 months is still acceptable, and if the landlord asks for more than this, then the deposit should be negotiated. Demonstrating you have a “good profile”: risk-free stable income on the long term, which is at least 3 times superior to the rent. You will find here a 2 page summary of the conditions of rental contracts in Spain, in the order and format of legal Spanish rental contracts. 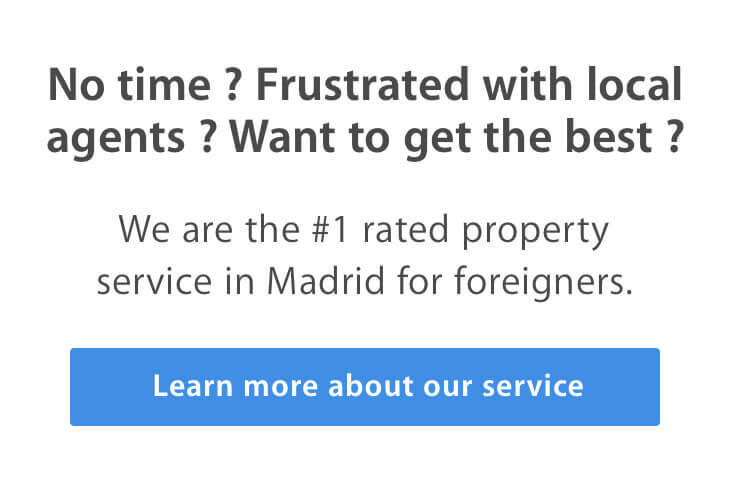 If you need help to move to Madrid zen, do not hesitate to send us an email ! PS: If you liked this, do spread the love and press the “google +” and/or “Facebook like” buttons at the top of the article !